The Sonicare 3 Series Gum Health toothbrush is a market leader that has the ADA seal of approval and promises healthier gums in just two weeks. It targets gums with its unique cup-shaped brush to gently remove plaque while protecting the gum line (view on Amazon). Sonicare 3 Series has tightly packed bristles to remove up to 3x more plaque than a manual toothbrush. Because of this, the brush can reach difficult areas. It also reduces gingivitis—a form of gum disease that causes redness and swelling—by brushing gently and suiting the shape of the gumline. While Sonicare and rival companies offer varying brush models, some features are more important than others when it comes to effective oral hygiene. So, despite the growth of features in electric toothbrush brands, choosing the wrong model may not only cost you a fortune, it can also have consequences for your dental health. This 3 Series Gum Health review is here to help. How does the toothbrush work? So: how does 3 Series Gum Health compare? Who is 3 Series Gum Health suitable for? Improves gum health up to 100% better than manual toothbrushes because of its sonic technology. Also removes up to 6x more plaque along the gumline than manual brushes. While many electric brushes include a basic rotary head—a circular brush head that rotates instead of vibrates— the Sonicare 3 Series toothbrush has a curved, densely-packed brush to best align with your gums. Each brush head ends with a soft tuft of bristles to avoid irritating the gumline. So, 3 Series Gum Health targets sensitive gums and promotes oral health by offering a gentle experience. On top of this, Sonicare 3 Series has 3 intensity settings so you can decide which level works best for you. the intensity can be adjusted at any time. The Series 3 toothbrush has a Smartimer which beeps at 30 second intervals. This means that you can ensure you are brushing all of your teeth evenly. Small charger and hard travel case. Along with this, Sonicare offers a 3-pack brush head replacement. Smartimer for an easy and effective clean. Great on the go: includes travel charger and hard case. Only comes with 1 refill head. Lacks features such as the 2 Series EasyStart program. 3 Series Gum Health uses sonic technology to create high-speed vibrations, which results in up to 62,000 brush strokes per minute. This high brush speed is what makes a sonic toothbrush. In contrast to other models like PowerUp, which can reach up to 15,000 strokes, Sonicare Series 3 can offer more effective cleaning that rivals its more costly competitors. Rather than having 1 default brushing mode for all, the Sonicare Series3 has 3 intensity levels that are easily adjustable. Although 3 Series lacks additional programs like EasyStart or Whitening options, its 3 intensity settings mean you can tailor the intensity to suit your comfort. While the average brushing time for Americans is 45 seconds, the ADA recommends using a timer to ensure the recommended 2-minute brushing time. With this in mind, Sonicare’s built-in Smartimer helps users to keep track of their brushing time, beeping in 30-second intervals to encourage even brushing. It is worth noting that the toothbrush has a battery of life of 3 weeks, which is the highest battery life of Sonicare toothbrushes. In contrast to brands like Oral B, whose brushes have an average battery life of 7 days, Sonicare’s battery life is relatively high and more eco-friendly than most electric toothbrushes. 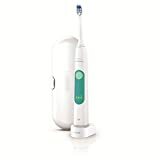 Like most Sonicare products, this toothbrush comes with a travel charger for on the go as well as at home use. Because it’s portable, your brush can be ready at all times. This product also comes with 1 ProResults Gum Health brush head. While this is designed for overall gum health, it is worth noting that the snap-on brush heads are compatible with all Sonicare brush models. Sonicare suggests replacing your brush head at least every 3 months. Firstly, the listed Sonicare products all include a Smartimer and 1 refill brush head. While the more costly HealthyWhite+ includes an extra whitening mode, its battery life is the same as Sonicare 3 Series and actually includes less brush strokes per minute. Because of its gentle and contoured brush head, 3 Series is most suitable for those prone to gum irritation and/or bleeding. 3 Series works gently along the gumline to prevent and reduce early signs of gum disease. While its price is mid-range, it includes 3 intensity settings, the same as some costlier models, to ensure a tailored brushing experience. However, the 3 intensity modes replace the EasyStart program—a mode that slowly increases brushing speed across 14 uses. While this is a selling point for those new to electric brushes, 3 Series’ modes are static and perhaps less suited to those new to electric brushes. Because of this, Sonicare 2 Series might be a more suitable transition brush for those who have already used an electric toothbrush. While Sonicare’s immediate battery life is consistently praised, its longevity is sometimes criticized because most brushes only last 1-2 years. Despite this, many still opt to use Sonicare as its immediate battery life is convenient and the brand is highly reputable and trusted. It is worth noting that correct use of Sonicare products is important. Importantly, Sonicare recommends charging each brush for 24 hours before its first use and to avoid keeping it on charge constantly. To change settings, press the button twice (once to pause, twice to change). Overall, this product has largely positive reviews and most buyers found the brand’s information accurate and helpful. In sum, 3 Series Gum Health is an excellent choice for those concerned about gum disease. While its price range is mid-to-low, 3 Series is equipped with sonic technology and 3 intensity modes to best cater to a range of users. Because of its curved shape and soft-ended bristles, it also targets those prone to irritation and redness by providing a gentle but effective brushing experience, in contrast to manual or rotary brushes. How do you change the brush setting? While 3 Series includes only one main ‘setting’ (clean) the level of intensity can be altered by pressing the button twice (once to pause, twice to change). How do I charge Sonicare Series 3? To charge your brush, attach to the included travel charger base. Sonicare snap-on brush heads are designed to suit all Sonicare models, so you don’t need a specific brush head. The Smartimer works by timing the brushing duration after the button is activated. Also, the Smartimer runs in 30 second intervals, signalling when it is time to move to a new quadrant of the mouth. Yes; Sonicare 3 Series is designed for those with sensitive gums. Because of this, the design is convex to fit the gumline and includes soft bristles to avoid causing irritation. No; pressing the button once will activate the toothbrush (and the Smartimer). After 2 minutes, the brush will turn off. You can also press the brush once to pause and twice to change the intensity. Like most Sonicare products, 3 Series Gum Health has a 2-year warranty. Can I use this product if I have gum recession? Yes; importantly, Sonicare 3 Series is designed to maximize gum care and the sonic technology takes gum recession into account. However, if you are concerned, either consult with Sonicare directly or ask your dentist. No; Sonicare 3 Series promises safe and gentle brushing for your oral health needs. As a result, this product is suitable for those with braces, veneers, or crowns. For hygiene reasons, Sonicare recommends changing the brush head every 3 months. In fact, Sonicare 3 Series includes color-indication bristles that fade to a pale blue when it’s time to replace. 1.7 x 1.7 x 7.3 inches.